Last week's unveiling of Marvel Vs. Capcom 3 came with an interesting walk-through by Capcom of their take on the history of fighting games. While Capcom's Seth Killian allowed that one could argue that 1985's Yie Ar Kung Fu was the proto-fighting game, providing a template to Street Fighter, it was his company's Street Fighter II, he said, that birthed the genre. 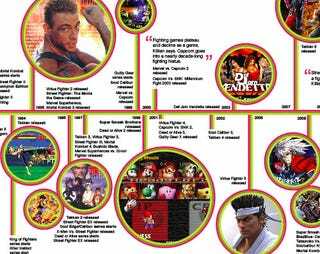 Here's a look at both the peaks and valleys of the fighting genre, as explained by Capcom, and the countless non-Capcom fighting games, as selected by Kotaku, that helped shape the landscape of fighting titles over the past two and a half decades. This is in no way meant to be a comprehensive list, rather a quick journey through some of the games and franchises of the genre. Thanks to intern extraordinaire Lauren Orsini for the wonderous graphic. Click on the image to enlarge. Note, due to space limitation many franchises were mentioned just once.